X2: The Threat is a 4X Strategy game, that takes on the form of a space ship simulator, not unlike the classic Elite or Privateer games. 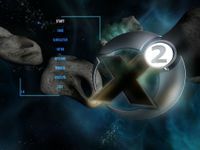 But unlike its spiritual predecessors X2 expands the features exponentially, creating a living universe consisting of a multitude of interlinked systems, habitated by many races and having a huge spanning economy with many different goods and factories for the player to explore and exploit. Packed with extremely nice visuals X2 delivers a stunning experience, that will keep the players seated in front of the screen for many days and weeks. Several patches and expansions were released since 2003, correcting many mistakes and bugs in the game and adding more events and most notably, gadgets and appliances for the players to use and heighten their in-game experience.